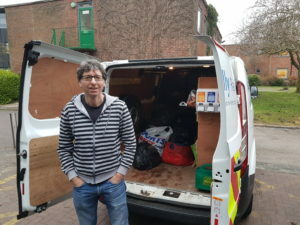 Staff and students from Edge Hill University contributed to fundraising efforts on behalf of Care4Calais (C4C) and their #CoatsforCalais appeal in response to the harsh weather being experienced by refugees in this area over Christmas and the new year. 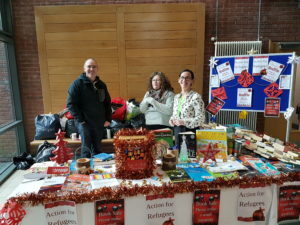 AfR fundraising event, Faculty of Education, December 2017. Donations of clothing in the background. L-r Martin Ford, Charlotte Hastings and Jo Watt. I loaded lots more donations from family and friends before setting off for France. 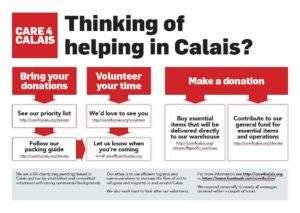 I delivered the donations in January and spent time with refugees and volunteers in and around Calais and Dunkirk. 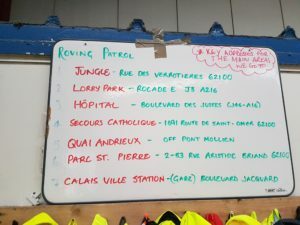 While I was waiting for the ferry at Dover a C4C volunteer phoned to let me know that they were currently distributing aid in Dunkirk so on arrival at Dunkirk I joined them at the Grande Synthe camp not far from the ferry port. 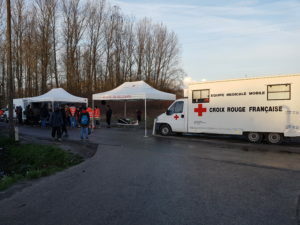 The French Red Cross visit Grande Synthe, also known as the Dunkirk Jungle, every Wednesday afternoon to provide (very) basic first aid and a phone charging service. Mobile phones are a vital way for the refugees to keep in touch with family and to hear news from home. The day I arrived was the warmest for 10 days. Despite this and my layers, after a couple of hours outdoors I could really feel the cold. It is difficult to understand how people survive in such conditions. Emergency overnight accommodation is provided for some refugees in Calais and Dunkirk if the temperature drops below a certain temperature, however, this is very limited and some are wary of using the shelters in case the authorities use it to check on the refugees’ immigration status. These shelters do not open every day. In Dunkirk it seems to be the Prefecture who makes the decision whether the accommodation is available or not. 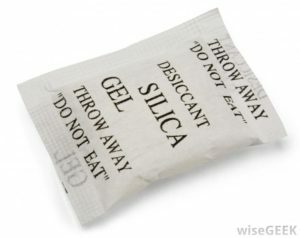 Tuck these little packs into gloves and socks to try to keep dry. Tabards are insisted on by C4C but many volunteers are ambivalent about wearing them when meeting refugees. There are currently around 1,000 refugees in Calais and Dunkirk sleeping rough; another 500 refugees in Brussels; and over 1,500 in Paris (C4C figures). C4C now operates in a wide area and regularly has volunteers in Paris, Brussels and Caen. There is a certain amount of partnership working between aid agencies on the ground. Refugee Community Kitchen (RCK) is a very important part of the emergency aid provided in the region. Refugee Community Kitchen (RCK). Volunteers always welcome. C4C volunteers and volunteers from other charities support their work. Since December 2015, RCK has cooked hot meals every day, 7 days a week. 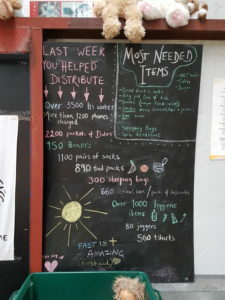 They have provided over 1.5 million meals and served over half a million tonnes of food. They are based in a purpose-built industrial kitchen in L’Auberge des Migrant warehouse, Calais, not far from the old Calais jungle. 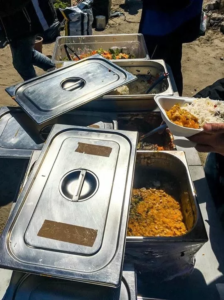 They distribute food every day in a number of locations including at the Grande Synthe camp in Dunkirk. 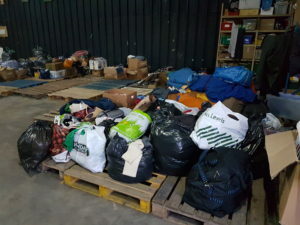 Donations from EHU delivered to the C4C warehouse, Bleriot-Plage, Calais ready for sorting. 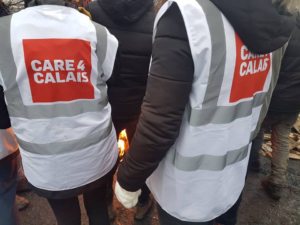 C4C has been operating in Calais since the summer of 2015, originally in the Jungle. 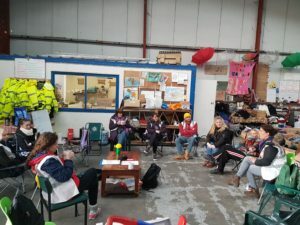 Since the Jungle was dismantled in October 2016 it has continued to support refugees wherever they are in the region from their base in a warehouse in a small industrial zone at Bleriot-Page on the outskirts of Calais. The daily morning briefing is when the plan for the day is shared and jobs are allocated to volunteers. 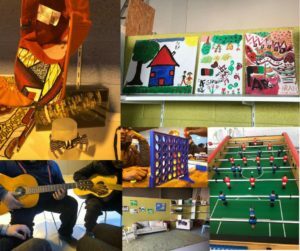 There is a day centre in Calais run by Secours Catholique that opens daily in the afternoon providing shelter, warmth, refreshments and various activities that sometimes includes English language tuition. 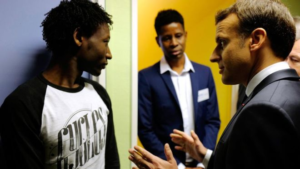 Activities such as this dependent on volunteers being available..
A few days after I returned, President Macron visited the area. He gave a speech to the police in Calais but not to the charities or refugees living rough in Calais. The photo below was taken in a refugee reception centre about 60km outside Calais. A new deal was announced between France and the UK which could result in more child refugees moving from France to the UK (hundreds, not thousands). President Macron visits Calais 16 January 2018. Interesting body language. Estimates vary, but there are about 900 refugees currently in Pas de Calais. The majority come from Eritrea, Ethiopia, Afghanistan and Sudan. Why do they want to come to the UK? Many have family living in the UK, have previously been to the UK or already speak English. Around 90% of those processed by the French have been found to be genuine refugees rather than economic migrants. It is interesting to note that a very small proportion of refugees in France want to come to the UK.